Jen's Cancer Fight | How Jen Beat Lymphoma. From Peter’s perspective. How Jen Beat Lymphoma. From Peter’s perspective. 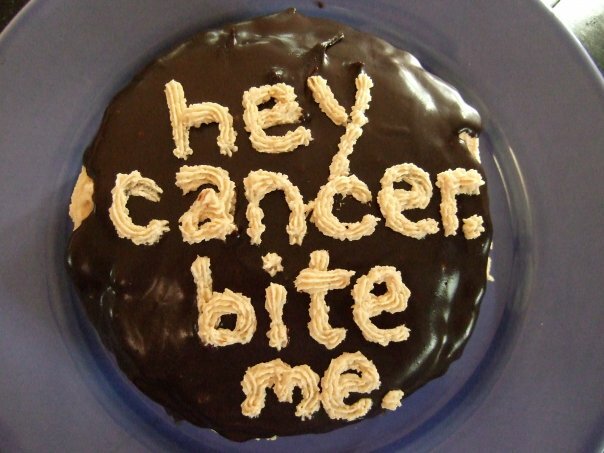 I periodically receive e-mails from people who have stumbled across my blog and are reaching out for support or answers as they embark on their own Cancer Adventure. The first question they always ask: “How are you?” So, here’s how I am. Five years ago, I went in to get some antibiotics for the hacking cough I couldn’t get rid of. A chest x-ray sent me to the CT scan place, who sent me back to my general practitioner, who sent me to a pulmonologist, who sent me to a cardio-thoracic surgeon, who sent me to an oncologist, who confirmed that I had diffuse large b-cell lymphoma. I had cancer. Five years ago. Five. Clinically, “5-year survival” is not that significant for my specific flavor of cancer. My doctor was pleased when I made it to 2 years of remission, after which the odds of my very aggressive cancer returning dropped dramatically. That happy day was June 15th, 2011. But socially, most of us non-doctors understand “5-year survival” as having beaten back the disease, having outrun the odds, drawing the long straw. Its a good thing. Five years is a really long time to live after facing your own mortality. I’m going to be 40 in just over a year. 40! I didn’t think I’d make it to 35. And my kids are 6 and almost-8, and I’ve been there, raising them, loving them, enjoying them. Five grateful years. My life is dramatically different than I think it would have been, without cancer. I used to be a lawyer. A good lawyer, yes, toiling at a prestigious law firm, litigating patents for Fortune 500 companies. But I was not happy. I was far more interested in being a lawyer, which to me was shorthand for smart and capable, than in doing what lawyers do. I took a break when my kids were born, and I was working on changing practice areas, trying to find that elusive passion, when I was first diagnosed. Even after my first round of treatment, I was looking for a new job…looking for a government lawyer job, of all things*…when I relapsed. The universe had to hit me over the head, hard, twice, to turn me away from that whole “what will people think when they meet me at a cocktail party?” mentality. Cancer, and an exceptional therapist, helped me build a life centered on what I want to do all day, not on what I want people to think. I don’t really go to that many cocktail parties, anyway. So I spend time with my handsome, fun-loving husband and my funny, quirky children, as much as we can. We’ve travelled to Amsterdam, Capri, Cape Town. To Tennessee and New York City and Rehoboth Beach and Orlando. To Pebble Beach, to Seattle, to Maine, to Chicago. We’ve gone on lots of kid-centered trips and lots of grown-up trips. I’ve found an outlet for my passion–cooking–that has provided enough income that I’ve been able to stay home with the kids. I am a competitive cook, and I’m really good at it. Yes, my friends, you are reading the words of the winner of the Sutter Home Build a Better Burger Cook-off, the National Cornbread Championship, the Crisco Mediterranean Inspirations Recipe Contest, the Gallo Family Recipe Contest and the Mama Mary’s Pizza Creations Contest, and a finalist in the Gilroy Garlic Cook-off, the Good Housekeeping Cook Your Heart Out Cook-off, and the National Beef Cook-off. Who knew? Cooking contests are far more fun than patent litigation, I promise. My other discovery is the day to day joy of family life. When I got sick, the hardest, most gut-wrenching aspect was the prospect of leaving my very young children. I remember making Zach’s tear-salted first birthday cake, thinking that it would be the only one I ever made for him. And later this week, I’ll be making cupcakes to bring to his 6th birthday, at the laser tag place, to watch him and his gang of rough and tumble six-year olds play together. I’ve watched my adorable toddler blossom into a seven-going-on-seventeen year old girl, who loves to read and cook and dance and spend time with her friends. My children make my heart pound with love and pride, and I am so thankful for these 1825 days with them. Long days, sometimes, but precious days. Everything in my life is not sunshine and rainbows. I’ve slowly gained weight over the last 5 years, and I struggle with my weight enormously. There’s not a direct relationship between cancer and the 50 pounds that I would like to lose to get back to my old, soft, curvy, but energetic self, but indirectly, yeah. I was fairly sendentary for at least 6 months after my stem cell transplant, lacking the energy to do much other than drop the kids at preschool, throw in a load of laundry, and watch TV on the couch. As my energy returned, I tried to get back into shape, taking up yoga and training to walk a half-marathon. But somehow, I haven’t been able to get the balance right between the delicious, mostly-healthful food I cook and the calories I expend. I also struggle with anxiety and depression, although I think I always did. I started seeing a counselor during a dark couple of months after my first bout of treatment, and have been seeing her, on and off, ever since. She’s helped me to identify how anxiety has driven so many of my choices in life, and given me tools to reduce anxiety in my post-cancer life, but still, sometimes I am paralyzed. I mention this only because when I was sick, I couldn’t imagine bad things happening if I got well: either life would be a merry dance with unicorns, or I’d be dead. I forgot about all of the greyness, when we just get things done, walking past the flowers without so much as registering their light scent in the air. Life is about the dance between the cloudbursts and shitstorms. The joyful moments, the memories we make, the rich experiences that we encounter. And I’ve had 5 years packed full of them, and for that I am grateful. *With apologies to my many government lawyer friends, there is not generally a great deal of passion in the day to day life of government lawyers. To do whatever I want for the rest of my long life! Amidst the whirl of the season, the shadow of this scan tomorrow was crammed to the back of my mind. But in the last lazy lost week, sitting home with a cold, wanting to stay busy but just lacking the energy to do much, I’ve been a little tweaked out. T-minus 18 days until my next scan. And so much to look forward to between now and then! Christmas parties….gifts to wrap….feasts to cook….cards to send…..twinkling lights at which to gaze. But tonight, I can’t sleep, and I have spent the last hour Googling post-stem-cell transplant blogs, and I keep coming across sites that have been abandoned because the bloggers have died. Seriously. I know better than to fall into the late-night-google trap. I’ve been here before, but I’m out of Ativan and Peter’s out with his geek buddies and, well, I’m feeling dark. the will to live itself. Six loaves of Vermont Sourdough. Thank you to everyone who has been sending good mojo and sharing hugs. The weight of the world is off of my shoulders, and I am flying high. Admission: I’ve been in therapy since last October, working through some of the stuff that goes along with being a cancer patient. And I’ve learned a lot, including accessing chapters-worth of healthy coping skills that were somehow missing from my user’s manual. I’ve put all of them to use over the past two weeks or so, as I approached my first PET scan since the transplant. Visualizing Dr. Spira giving me the good news. Keeping busy. Exercising. Minimizing googling “post-transplant relapse”. But yesterday, the day before my appointment, I just didn’t feel like using coping skills. I just wanted to freak out. Because I’m 35 years old with two tiny kids and a joyful life and a circle of warm, fun friends and a husband I adore and lots of ideas about a rich and engaged future and I have had two bouts with cancer and been through such crap and done 9 rounds of serious, serious chemo and 28 days of radiation and a f’ing stem cell transplant and lost my hair twice and crapped myself in pain and already am pretty sure I’ll end up with some sort of secondary cancer induced by all of this poisonous treatment in 10 or 20 years, best case, and called in every favor I’ve ever been owed and relied on the kindness and generosity of my friends to get through it and am just starting to give back and I have this nagging cough that won’t go away and I know I’ve fired my two anti-cancer torpedoes and if I relapse now there’s not a lot of hope for a cure and I’ll just spend the rest of my life in some sort of treatment and it is just not fair. So yesterday I let the crazies win. My options were to go an a major bender, to Xanex myself into oblivion, to devour mountains of food, to pick up a pack of Marlboro Lights and go for it, or to indulge in some seriously compulsive behavior. I went with the compulsive behavior, went to the store for 20 pounds of bread flour, and started making sourdough breads. Right now my countertops are groaning under the weight of loaves rising, starters multiplying, soakers soaking. Vermont sourdough. French country boule. Sweet potato walnut batards. Whole wheat polenta loaves. Sesame semolina. Something with figs….still working on that one. Rye. All wild-yeast raised! There’s a thin coat of flour on every flat surface of the first floor. It’s nutty. But seriously, if you have issues, knead some dough. It works. Anyhow. Crazies have won. I showed up for my scan at 8 am this morning (having fed the starter and taken 4 loaves out of the fridge, where they’ve been retarding overnight), waited for an hour, and then learned that the scan camera was down. So I’m home, waiting for a call from the radiology practice, twitching like a meth addict, and getting ready to bake. Here it is, the end of July, and the end of the Great Stem Cell Transplant Adventure of 2009. I’m really not feeling remotely “patienty” anymore; I’m pretty much just going about my business. There are the occasional energy crashes, but who doesn’t have those? I’m having such a good time with the kids, and have planned a way-too-kidcentric August full of pool days, road trips, and berry-picking outings. Basically, there’s nothing to report from Cancerland. I hear it is nice there, this time of year, but I’m not looking to go back any time soon. I have a scan in late September, and I’ll probably post about that, but for now, the cancer fight is won, and accordingly, the blog is likely to be a bit quiet. Thanks for reading, all these long months, and for posting comments, sending email, and sending positive energy my way. Cancer is a team sport, and I am incredibly grateful for all of you choosing to be on my team. I have officially completed the treatment protocol. I got my gold star today…my counts are steady and climbing, my energy is slowly returning, and I feel good. I’ve been sent back to my regular oncologist for normal remission monitoring. I’m not a transplant patient anymore; now I am a survivor. My friends, I just can’t tell you how good I feel. After an extended illness or period of discomfort, feeling neutral, or even a little healthy, feels so, so good. So good. So very good. I appreciate the not-sick so, so much. Yesterday included a stop at the transplant clinic, where I learned that my white count is a little low, my red count is still low but moving in the right direction, and that I have platelets to spare. All is well. I was dismissed until my next visit, the all-important 30-day checkup, after which all of my infection and behavior controls are lifted, and I am officially discharged from the transplant program. I am still tired, but I’m getting a handle on the ebb and flow of energy through the day. And I’m doing a lot…today, for example, I got up with the kids and got them fed, dressed and dropped at Sewusen’s. I went to the farmer’s market for the first tomatoes of the season (although, they don’t have that intoxicating scent yet…might be a few weeks away, still), did two loads of laundry, baked homemade burger buns, spent some time with Ginna, picked up the kids, and went to Pizza Thursday, our block’s weekly outdoor pizza-beer-and-juice-box soiree. Yes, I watched a few Cold Case reruns, and crashed at the end of the pizza party, but for a girl 24 days off a stem cell transplant, I’m doing just fine. Right now I’m dappled and drowsy and ready for sleep, but it was time for an update, and it feels so good to have good news. * Last night, as I was trying to fall asleep, I was contemplating the 59th Street Bridge Song, and got all caught up in the line “Got no deeds to do, no promises to keep” and how that state was making Paul Simon feel groovy, while a generation or so earlier, it was the state of having promises to keep that broke the spell of the frozen woods, taught by high school American Lit teachers as a symbol of suicidal ideation, for Robert Frost. Interesting. What does it all mean? An update from the purgatory between sickness and health. I feel pretty good…sometimes. And other times, I’m so overwhelmed with fatigue that I can hardly stand up. I haven’t figured out how to handle the rhythm of my day yet, nor how to manage my finite supply of energy without completely crashing. Luckily Peter and my sister Suzy, the angelic helper o’ the week, have been really patient with me, stepping right in to help when things go south. But I’m frustrated. I feel good enough to have “big” ideas about what I want to do in a day but not enough gas in the tank to make it happen. It is normal, expected, la la la, but still, frustrating as hell when you are in the middle of something and have to bail. And these somethings are pretty low-key….making the bed, picking up new flip-flops for the kids, prepping dinner. I watch a lot of Cold Case these days. A lot. Tomorrow, it is back to the clinic after two days off, so we’ll see where my red cell count is. Red cells are one of the keys to overcoming fatigue. I’m also hoping to be cleared for restaurants and driving, but, I don’t know. I’m not sure I should be driving yet. Hrm. Maybe I’ll just be cleared for Peter to drive me to a restaurant. My kingdom for a glass of really cold sauvignon blanc.